MenuCP gives restaurants & C-stores the freedom to take online orders for carryout or delivery! MenuCP software is perfect for restaurants or C-stores that offer carryout or delivery! MenuCP online ordering pages are reactive; the pages resize to work on phones or any size screen. Menu Control Panel (MenuCP) is an online ordering system for convenience stores (C-stores) and restaurants. 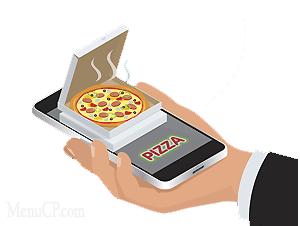 MenuCP will give your customers the flexibility and convenience of placing food orders online for pizza and other food, for delivery and/or carryout. The system can be incorporated into your existing website, or can be a stand alone website that is hosted by MenuCP. Give Your Customers What They Demand! 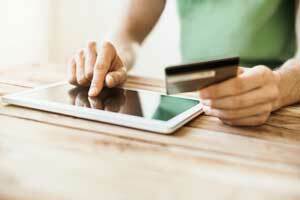 Do your customers prefer to order online or over the phone? Customers can take their time to figure out their order, which increases customer satisfaction. Save employee phone time, employees can check computer as needed, reducing payroll cost. Customers see different menu options, or menu items they are not familiar with, which can result in ordering more toppings or selecting more expensive menu items. Online order systems can increase order size and also cause more frequent ordering. Add menu items, categories, and addon options. Set prices, create coupons, or daily/weekly specials. Set fees, tax rates, delivery/carryout availability, and other options. Take orders online automatically, customers pay by cash, check, or credit card. 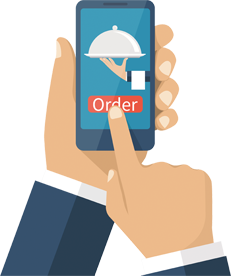 View orders at your business from computer, tablet or smartphone, receive email/SMS text order notifications. While pizza restaurants may have been the first to widely adopt online ordering into their business model, the MenuCP software is flexible and built to accommodate any type of business that offers products for pickup / carryout or delivery. Therefore, the software can be used by restaurants, C-stores, grocery stores, food trucks, coffee shops, catering businesses, etc. Even non-food businesses like business supply stores, parts stores, and others can benefit from offering customers a way to order products online to be picked up at the business. Before you register your restaurant or convenience store with any online ordering system, will they guarantee your satisfaction unconditionally a month later? We do, as we value your business and your satisfaction!